Copyright © 2016 Janis Burgin, JB Art Studio. All Rights Reserved. 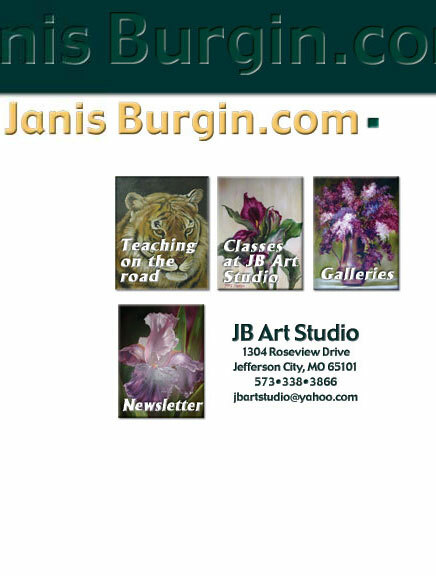 All text, graphics, HTML and contents of this website are protected by US and International copyright laws and may not be reproduced or distributed in any manner without the explicit permission of Janis Burgin or MEG Originals. My mission is to help all individuals to open themselves up to the opportunities they have to enjoy life to it's fullest. As for me, I enjoy the simple pleasures of painting and creating, using my imagination. Making something from nothing the best I know how; then sharing what I have learned with others.